The Clear Choice For Glass Service From auto glass repairs to residential glass, we’ve got you covered. Get Started Get Started Now! Your Local Glass Service We can't find where you are located, please enter your zip code. At Portland Glass, we’ve got all your glass needs covered. Is your windshield cracked? Do you have glass units in your home or place of business that need to be replaced? No matter what your request may be, Portland Glass is proud to offer auto glass and flat glass solutions that are second to none. There's nothing more frustrating than scheduling a service with a glass company only to have them tell you that they don't have the tools or knowledge to provide you with what you need. Thankfully, our team of glaziers specializes in a little-known professional trade that focuses primarily on replacing and restoring every specific type of glass. For glass solutions made easy, call(866) 747-8416(866) 747-8416. Contact us today to request a free quote for your next service. 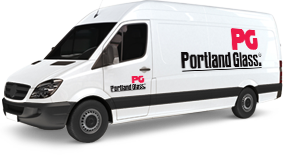 Portland Glass has been performing fast, top-quality repairs since 1947. We've always been innovators when it comes to making glass repair and replacement easy for the customer. Our experienced team believes that going above and beyond to provide a first-rate service every time is the best way to ensure your satisfaction. That's why we offer to take care of the paperwork and talk to insurance companies for you. We’re also EPA-certified and back all of our services with a 100% customer satisfaction guarantee. Portland Glass is looking for qualified candidates at locations throughout the Northeast. Learn about our rich history of serving New England with innovative technology and unparalleled customer service.